What is Mobile Learning - Home? Mobile Learning technologies include few hand-held devices namely smart phones, MP3 players, mobile phones and phablets (a tablet operated as a calling device). The feature that Mobile Learning focuses the most is on providing the learners a flexibility of time and place. 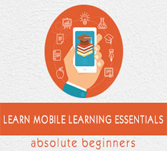 The content for learning mobile is made available for easy access and convenience of the learner. Mobile Learning is very essential part which lets the educational institutions to enhance their educational services apart from the boundaries of their classrooms right into the reading rooms of their learners. There are many institutions which tie up with many such platforms which work on providing their content respective to the user availability. By doing this, it attracts many students, parents and teachers towards education. User is expected to have basic knowledge of social learning, e-learning and collaborative online efforts.